More than forty athletes braved the cold and strong winds to complete a good training session this morning. To follow this up there will be the normal long run from the track on Sunday, a run on Monday from the track at 6.30pm and the usual club night from Judd School, on Tuesday. There were about 88 people taking part in the club's Boxing Day handicap run, organised by the Bradley family. It was good to see so many there, with Elizabeth Heslop taking home the trophy for the overall first place. GPS readings came out as the course being between 4.97 and 5.04km. Fastest laps - Robbie Farnham-Rose 15.06, Charlie Joslin-Allen 15.07, Corey De'Ath 15.59, Tom Cox (dressed as an Elf) 16.10, Jamie Goodge 16.24, Chris Cohen 16.30, Michael Ellis 16.44 Female - Maria Heslop 19.24, Abigail Johnstone 20.58, Nicola Summerfield 21.10. Full results on the Results 2014 page. It was good to see so many at Knole Park on Christmas Eve morning and all working hard. We had 59 athletes taking part. We hope to see as many as possible on Boxing Day morning for the club handicap and also at Knole Park on Saturday for a hill session. Frank Coates - "Where's my relay partner got to ?!" 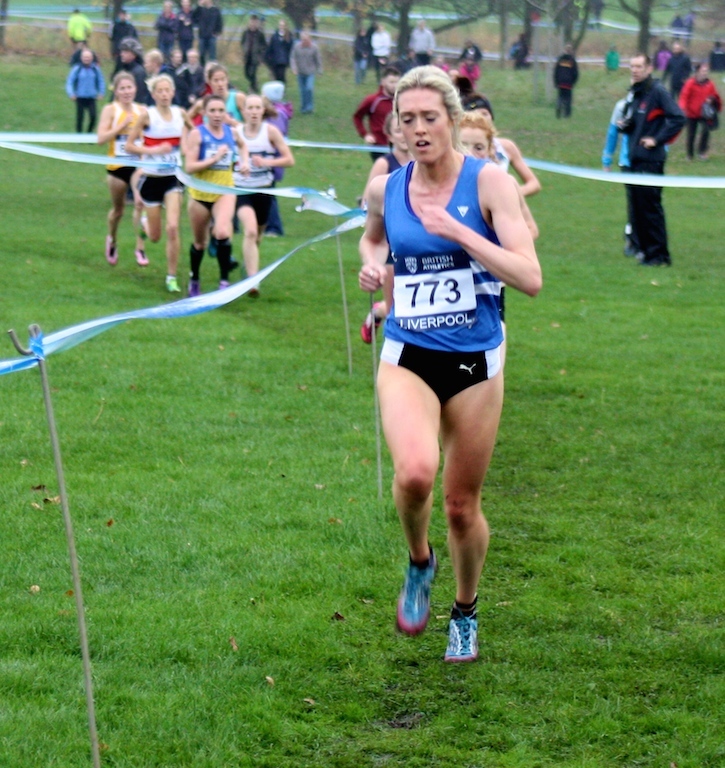 In Brussels today at the Lotto Cross Cup, international cross country meeting there has been some strong TAC performances. Girls born 2000/2001 1st Kathleen Faes. Won by 31s over 2kms. Senior women - Ashley Gibson (2nd claim TAC, representing England) 20th and 4th Brit. 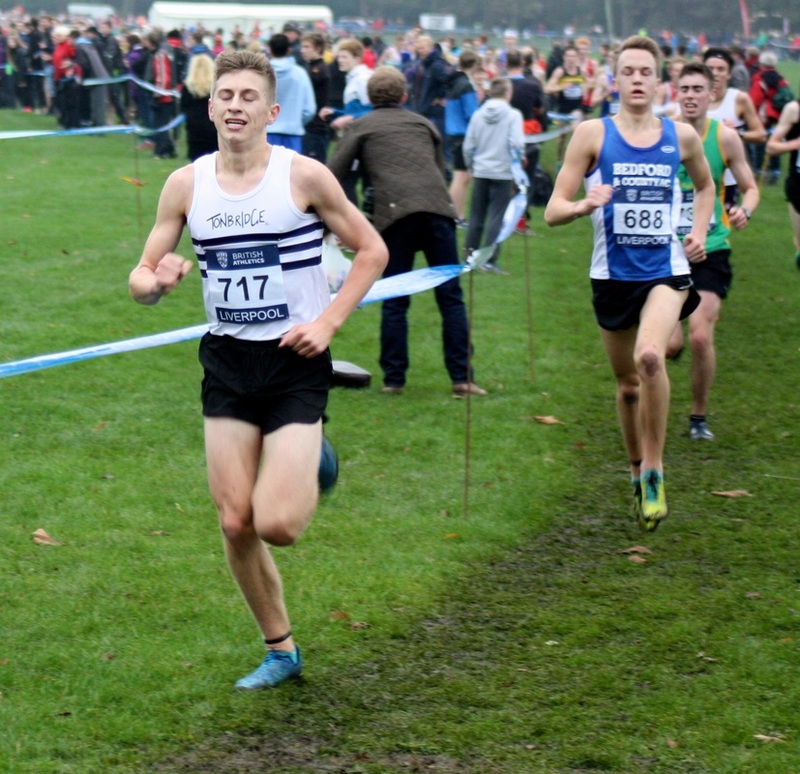 Senior men - Henry Pearce (representing South of England) finished 29th in a truly international race. 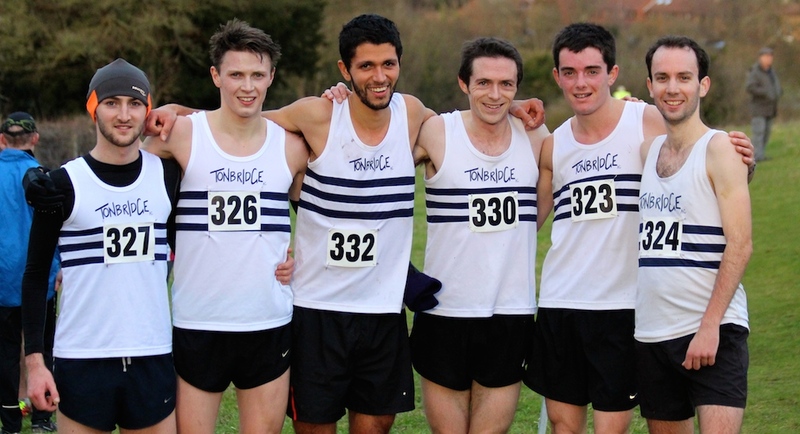 Tonbridge AC's senior men clinched the South of Thames Cross Country Championship for the third year in a row, at Farthing Downs, Coulsdon, on Saturday. The event is more than 100 years old and TAC was formed 67 years ago and the club has only one this the three times. However, it was a very close call, with just two points separating TAC's 114 points from Brighton (116), with Herne Hill Harriers third with 122. The men and women ran the 7.5 miles together, over a very tough terrain, used by former 5000m world record holder, Gordon Pirie, for training back in the 50s and 60s. Ryan Driscoll led our charge early on, as he held second place, but slipped to 4th at the end, with Ben Cole moving through to an impressive 3rd. Dean Lacy of Cambridge Harriers won the race. With an unwell Dan Bradley dropping out early on and Julian Rendall suffering from a tight hamstring late on, it was probably Tom Cox's surge over the final mile that clinched the win (6 to score). Lucy Reid looked very strong and won the women's silver medal for her second place. Sophie Foreman (7th) and Chloe Bird (9th) also ran really well, but we just didnt have enough runners out to complete a six to score team. Belgrave won with 91 points. At Tonbridge TAC filled the first three places through Luca Russo (16.33 debut), Andrew Mercer (16.58) and James Puxty (17.16 pb), whilst Phoebe Barker was the first female in 19.49. At Maidstone Graeme Saker (17.07) was second and just four seconds from his best, whilst Ellen Combie (20.32) was the first female. Joe Watts was the first TAC home at Royal Tunbridge Wells in 23.24. In the file below is the schedule for club training and racing over the Christmas and New Year period. 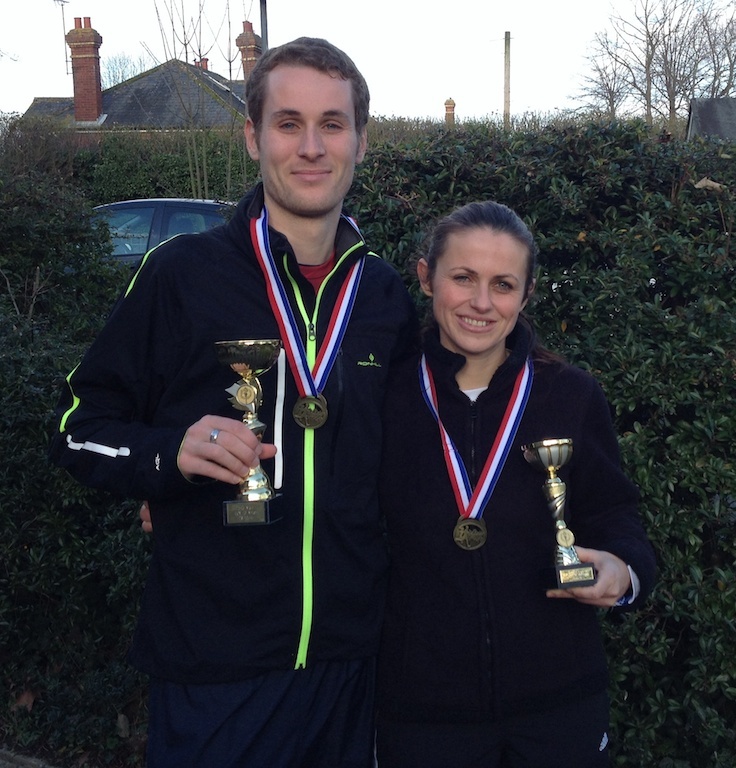 The Tonbridge parkrun was the second one of the TAC Winter Grand Prix, as organised by Mark Pitcairn-Knowles. The latest league table is in the file below. 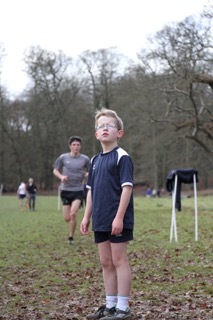 The December Junior 1 mile races were held at Tonbridge School fields, although numbers were down from the usual. Maria Bragin was the first girl home and George Horgan was second overall. Results are on the Results 2014 page. Alex Hookway and Ewan Wood were the only two TAC distance runners in action at Lee Valley on Sunday. Ewan ran around 2.30 for 800m, whilst Alex won the A-race in 2.01.33, with his first experience of an indoor event. Tonbridge had a good proportion of the Kent squad competing and there were some fine performances. Maybe the pick would be Euan Nicholls and Chloe Bird, who excelled and moved to another performance level. 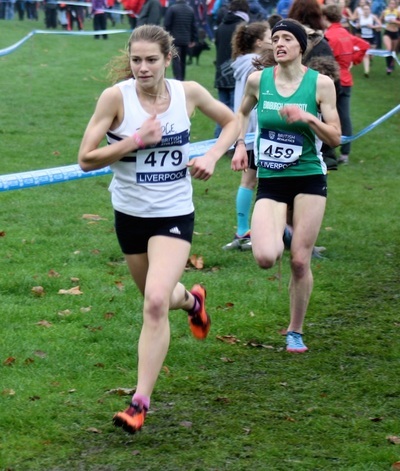 Ashley Gibson - England women's team for Brussels Cross Country International on 21st December. (Ash is 2nd claim TAC). Plus selected for the North of England team for the Edinburgh International in January. 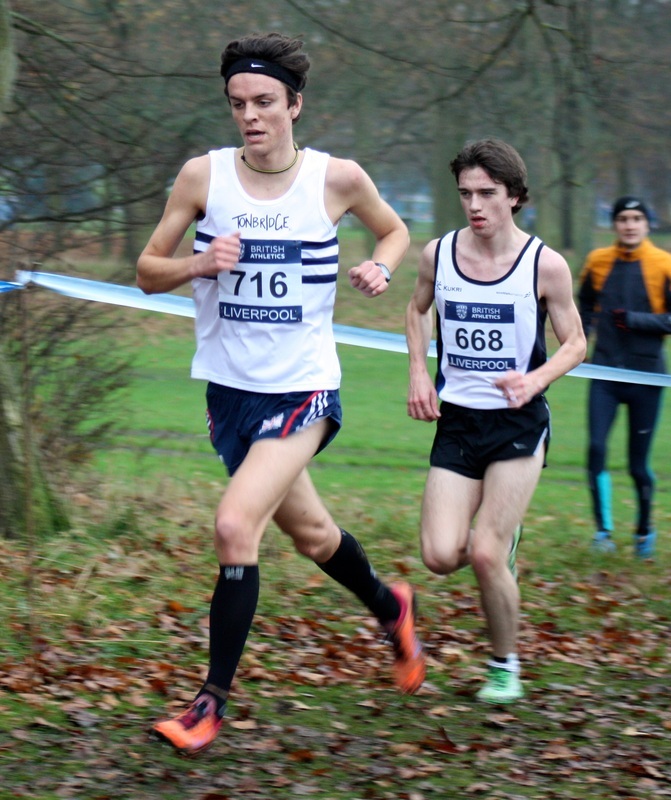 On Saturday, Alex Howard has captained Oxford to a win in the varsity match over Cambridge, at cross country. Alex himself had a good race to finish 8th in a high quality field. 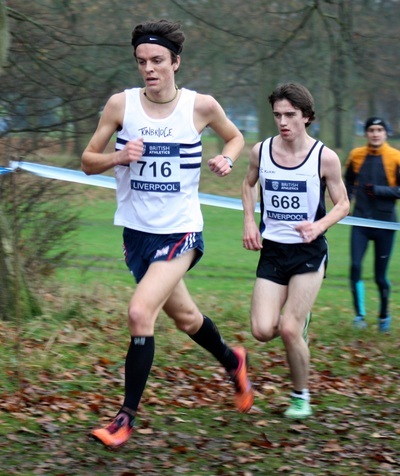 Also on Saturday, Henry Pearce placed fourth in the Birmingham Cross Country League, whilst racing for Loughborough University. See Results 2014. 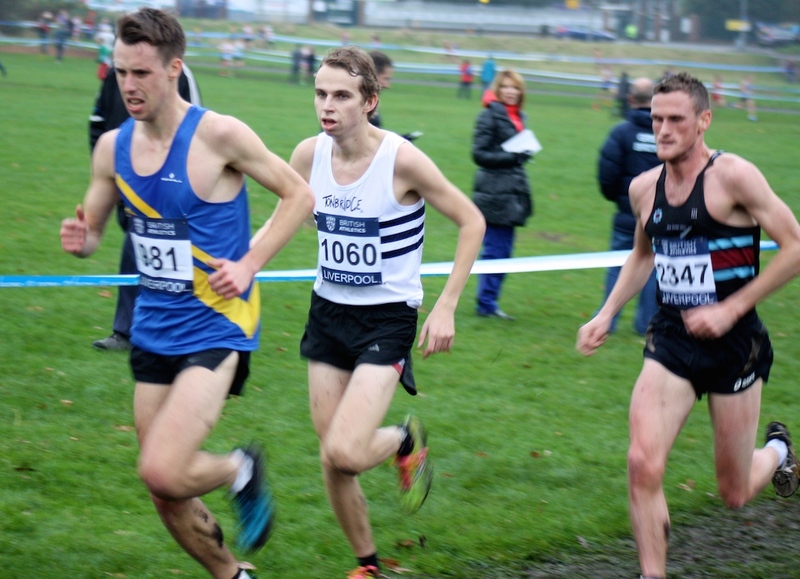 James West ran a leg for Loughborough University at the Leeds Cross Country Relays. See Results 2014. On Sunday morning Dan Watt was second in the Thanet Road Runners 10 mile road race, with a huge personal best of 55.23. Ben Cole, running as second claim for Swindon Harriers, finished second in the Oxford Mail Cross Country League. See Results 2014. In cold but sunny conditions there was a terrific turnout for TAC and also overall at these championships. The first event saw the over 50 men race over 10 kilometres, in what must have been one of the strongest races in the country for this age group. Ben Reynolds, representing TAC, was soon at the front and came home ahead of Graeme Saker, who held off TAC coach, but Tunbridge Wells Harrier, Andy Howey, for second. 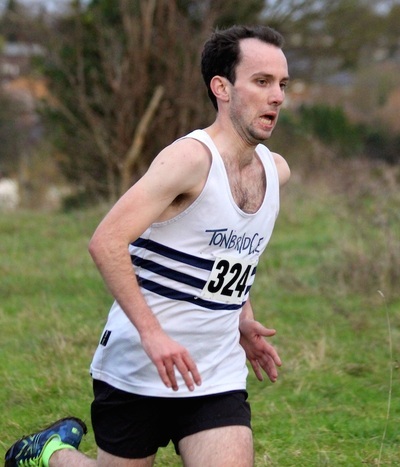 Tonbridge captured the team title with Phil Coleman in 9th, completing the scorers. There were an impressive 63 finishers in this age 50 to 59 age group alone. Race 2 involved the men over 60 and all the women's age groups, over 5.4km. There were fifty finishers in the mens event with Brian Buckwell our first home in 23rd. Lucy Pitcairn-Knowles was 15th and Estelle Fenton 17th in the women's 45 to 54 category, but unfortunately we didn't have a third runner to complete the team. In the final event of the day, the 40 to 49 men's age group, competed over the 10 km course. Andrew Mercer was making his official TAC debut and showed what a strong runner he is, with a fine second place overall. Andrew has previously run for Serpentine AC and competed in triathlons, but a few of you will know him from being a Tonbridge parkrun regular. Andrew was followed in by Adam Styles (12th), Mark Pitcairn-Knowles (27th) and Duncan Ralph (69th) , as 73 runners finished. Unfortunately the team score of 110 points missed the bronze medals by just one point. Results are on the Results 2014 page. There were plenty of good parkruns this weekend by TAC distance runners. The fastest came at Fulham Palace, from, Chris Olley, who ran 15.39. This was a little outside his own course record but, with the overnight frost, conditions were reported as slippery. Stuart Brown lowered his personal best at Tonbridge to 17.08 and led James Puxty (17.19) and Ollie Dunn (18.05) also to pbs, as they filled the first three places. Abi Johnstone was the first female home with another pb of 21.11. I have to says its very impressive just how many TAC teenagers are making the 9am start time ! Also a mention for Eva Kolivoskova-Martin who had managed her first four sessions/runs at Tonbridge AC in the last couple of weeks. She ran a pb of 22.46, dipping under 23 minutes for the first time. Over at the Royal Tunbridge Wells event, Dan Bradley included the parkrun into a training run and was first home in 18.08. At Maidstone, Harry Brown was the first TAC to finish in fifth in a pb of 19.53. Tom Cox made his debut at a road 10km event and split a couple of excellent athletes from Sussex at the front of the race. Tom finished second with 33.20 on a very demanding course and was 20 seconds down on Kevin Rojas and 14 seconds ahead of Neil Boniface. Both these two have recently run half marathons in 68 minutes and low 31 minutes for 10k. 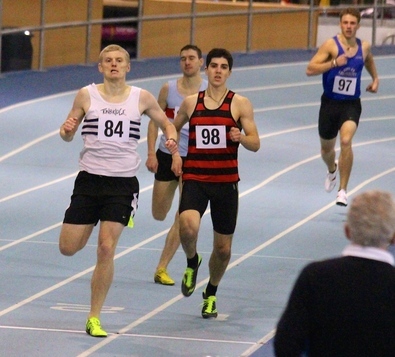 In fourth was Dan Watt, who ran 34.51 (result says 33.51), whilst TAC coach, Andy Howey was 12th in 36.48. 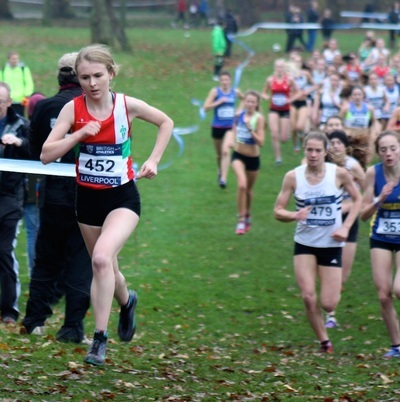 TAC had fourteen runners competing in the British Cross Challenge, plus second claim members Ashley Gibson (Morpeth) and Olivia Lucas (Aldershot). The likes of Henry Pearce, Lucy Reid and George Duggan had perhaps their best cross country runs of the season so far. However, for others there were disappointments, especially three or four who had aspirations of getting near to the spots for an international call up. With the cancellation of the Kent Cross Country League fixture, there were plenty who took on the Saturday parkruns instead. Dan Bradley was first home at Tonbridge, with 17.05 and was followed home by Andrew Mercer and Stuart Brown. Abi Johnstone was the first official female with 21.23, although I believe Kathleen Faes ran, without being recorded in the results. 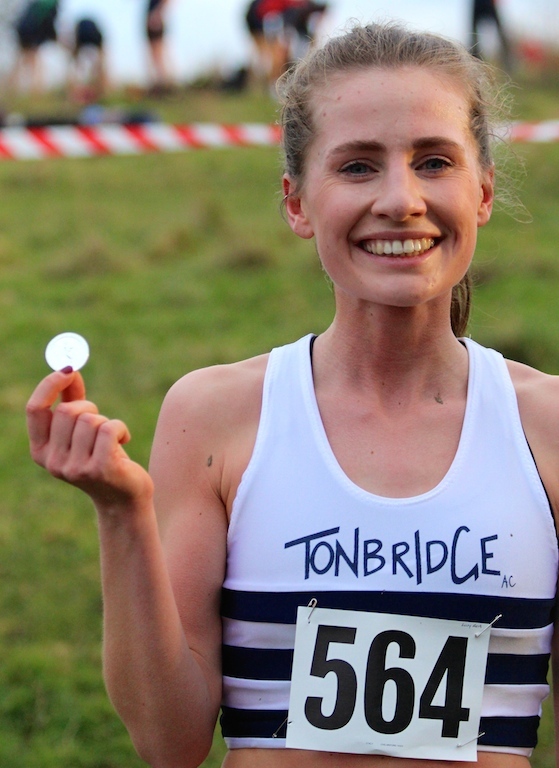 Sam Avis ran a pb of 18.52 at Maidstone, being the first TAC home and 7th overall, whilst at Royal Tunbridge Wells, Matthew Taylor (not 11 until February) was 4th with 20.34. Judd, Skinners, Sevenoaks and Walthamstow Schools, from the local area, all included TAC runners in their teams at the English Schools Cross Country Cup Final, held at Newquay, Cornwall. There were some excellent performances, with Judd winning the Junior Boys trophy and Sevenoaks finishing second in the Inter Girls competition. From an individual point of view the top runs came from James Puxty with second in the Inter Boys race and Phoebe Barker fourth in the Inter Girls. Kent Cross Country League, at Danson Park, 29th November - CANCELLED !!!!!! The event was cancelled by the organisers, due to concerns relating to the potential cost of park repair, due to the muddy conditions. News is awaited as to whether the fixture will be rearranged.